Get a sense of the local culture at Nossa Senhora da Paz and Igreja de Sao Miguel Arcanjo. 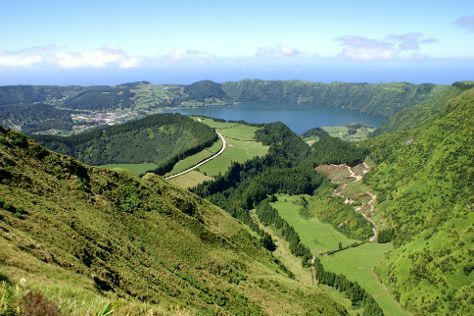 Escape the urban bustle at Poca Da Dona Beija and Caldeira das Sete Cidades. Explore Ponta Delgada's surroundings by going to Caldeiras da Lagoa das Furnas (in Furnas) and Mosteiros (Natural Pool & Mosteiros Beach). The adventure continues: get up close to creatures of the deep with a dolphin and whale watching tour, take a tour by water with Boat Tours & Water Sports, delve into the lush surroundings at Lagoa das Furnas, and trek along Rocha da Relva. For more things to do, traveler tips, photos, and tourist information, refer to the Ponta Delgada trip planner . Toronto, Canada to Ponta Delgada is an approximately 9.5-hour flight. The time zone changes from Eastern Standard Time to Azores Time, which is usually a 4 hour difference. Traveling from Toronto in May, you can expect nighttime temperatures to be a bit warmer in Ponta Delgada, with lows of 17°C. Finish up your sightseeing early on the 9th (Thu) so you can travel to Fatima. Fátima is a civil parish in the municipality of Ourém, in the Portuguese Santarém District. You'll discover tucked-away gems like Convent of Christ and Monastery of Alcobaca. Batalha Monastery and Castelo de Óbidos will appeal to history buffs. Get out of town with these interesting Fatima side-trips: Castelo de Tomar (in Tomar), Obidos Village (in Obidos) and Capelas Imperfeitas (in Batalha). There's lots more to do: don't miss a visit to Shrine of our Lady of the Rosary of Fatima, take in the architecture and atmosphere at Basilica da Santissima Trindade, examine the collection at Museu de Cera, and steep yourself in history at Capela Das Aparicoes. For ratings, reviews, where to stay, and tourist information, you can read our Fatima tour itinerary maker site . You can do a combination of flight and bus from Ponta Delgada to Fatima in 6 hours. Alternatively, you can do a combination of flight and taxi. You'll lose 1 hour traveling from Ponta Delgada to Fatima due to the time zone difference. Traveling from Ponta Delgada in May, plan for a bit cooler nights in Fatima, with lows around 13°C. Cap off your sightseeing on the 12th (Sun) early enough to go by car to Evora. Discover out-of-the-way places like Templo Romano de Evora (Templo de Diana) and Monsaraz Castle and Walls. Your itinerary includes some good beach time at Praia Fluvial de Mourao and Comporta Beach. Explore the numerous day-trip ideas around Evora: Sanctuary of Nossa Senhora da Visitacao (Montemor-o-Novo) (in Montemor-o-Novo), Estremoz (Mother Church of Sta Maria & Castelo da Rainha Santa Isabel) and Museu Do Fresco de Monsaraz (in Monsaraz). And it doesn't end there: take in the spiritual surroundings of Capela dos Ossos, don't miss a visit to Centro Historico de Evora, take a memorable tour with Tours, and pause for some serene contemplation at Igreja Matriz das Alcacovas (Alcacovas). Quickly create a custom-made itinerary for Evora using our trip planner. You can drive from Fatima to Evora in 2.5 hours. Other options are to do a combination of bus and train; or take a bus. Traveling from Fatima in May, expect nights in Evora to be about the same, around 13°C, while days are somewhat warmer, around 30°C. Finish up your sightseeing early on the 16th (Thu) so you can go by car to Sagres. Kick off your visit on the 17th (Fri): kick back and relax at Praia do Zavial, then kick back and relax at Telheiro Beach, and then contemplate the long history of Belixe Fortress. Get ready for a full day of sightseeing on the next day: visit a coastal fixture at Cape Saint Vincent, kick back and relax at Praia do Amado, and then enjoy the sand and surf at Praia Vale Dos Homens. To find reviews, maps, and more tourist information, read our Sagres trip itinerary maker site . You can drive from Evora to Sagres in 3.5 hours. Alternatively, you can take a bus; or do a combination of train and bus. Plan for somewhat warmer nights when traveling from Evora in May since evenings lows in Sagres dip to 18°C. Finish your sightseeing early on the 18th (Sat) to allow enough time to drive to Albufeira. You'll get in some beach time at Praia dos Olhos de Água and Praia Dona Ana. Escape the urban bustle at Praia da Marinha and Praia do Camilo. Get out of town with these interesting Albufeira side-trips: Praia da Rocha (Praia Da Rocha & Casa do "Vo" Serafim), Tres Castelos Beach (in Portimao) and Lagos (Dolphin & Whale Watching & Ponta da Piedade). And it doesn't end there: kick back and relax at Falesia Beach, appreciate the extensive heritage of Old Town Faro, and stroll through Algarve. To find ratings, photos, traveler tips, and other tourist information, read our Albufeira driving holiday planning website . Traveling by car from Sagres to Albufeira takes 1.5 hours. Alternatively, you can take a bus; or do a combination of bus and train. In May, daytime highs in Albufeira are 28°C, while nighttime lows are 18°C. Wrap up your sightseeing on the 22nd (Wed) early enough to drive to Lisbon. 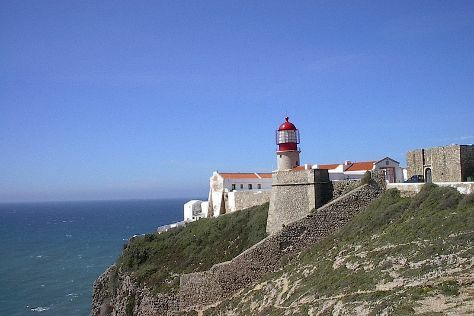 Get outdoors at Cabo da Roca and Praia de Melides. Get some historical perspective at Castelo dos Mouros and Jeronimos Monastery. Get out of town with these interesting Lisbon side-trips: Guincho Beach (in Cascais), Sintra (Sintra National Palace, Quinta da Regaleira, & more) and Praia da Aberta Nova (in Grandola). The adventure continues: steep yourself in history at Belém Tower, admire nature's wide array of creatures at Lisbon Oceanarium, take a stroll through Rossio Square, and don't miss a visit to Praca do Comercio (Terreiro do Paco). To see where to stay, more things to do, ratings, and more tourist information, you can read our Lisbon day trip planner . Traveling by car from Albufeira to Lisbon takes 2.5 hours. Alternatively, you can take a bus; or take a train. Plan for little chillier nights when traveling from Albufeira in May since evenings lows in Lisbon dip to 15°C. Finish up your sightseeing early on the 26th (Sun) so you can travel back home.